One of the origins of of probability as a field in mathematics was solving games of chance. The famous correspondence between Fermat and Pascal in 1654 was one of the earliest accounts on how to use mathematics formally in order to solve a fair game of chance. The dice to be used in the game below is the standard 6-sided die whose number of dots are from 1 to 6. This means that the smallest possible sum is 1 + 1 = 2 and the largest possible sum is 6 + 6 = 12. Below are the instructions on how to play the game. Add the number of dots. If the sums are 2, 3, 4, 10, 11, 12, then the player wins. If the sums are 5, 6, 7, 8, 9, then the casino wins. Looking at the game above, it seems that the game favors the player. As we can see, there are six possible sums that will make the player win: 2, 3, 4, 10, 11 and 12. On the other hand, there are only five possible sums that will make the casino win: 5, 6, 7, 8, and 9. If a player who has no mathematical background will be given a chance to choose between the two sets of numbers above, they will probably choose the one with the six possible sums. In reality, the casino will actually win using the game designed above if numerous games will be played. We can see this if we enumerate all the possible sums in a table. Suppose the color of the two dice are red and blue, then we can create a table that will display all the possible sums as shown below. From the table, we can see that that there are 36 sums. As mentioned above, the lowest sum is 2 and the largest sum is 12. We can also see that although the sum contains numbers which are the same, they are all results of 2 distinct pair of dice. For example, although there are six 7’s (green cells), each of them are results of distinct addends. For instance, the sum 6 + 1 is different from the sum 6 + 1 . From the table above, if we count the sums 2, 3, 4, there are only six of them. This is also the same with 10, 11, and 12. 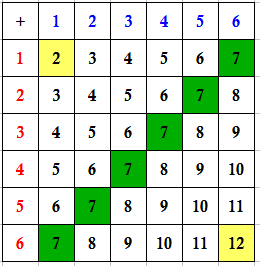 Therefore, there are only 12 possible sums that will make the player win. However, since there are 36 possible sums, 36-12 = 24 sums will make the casino win. This means that the probability of the player winning is while the probability of the casino winning is . From this calculation, the casino has actually two wins for every three games played. We have seen above the power of probability on how to assure game results. Despite the dice is fair (unloaded), as the number of games increases, the casino will eventually actually win.